Look, I know we’ve been starved for IPOs… but this is ridiculous! Thursday was the debut of Changyou.com (NASDAQ:CYOU) a Chinese website portal spun-off Sohu.com (NASDAQ:SOHU). Changyou is a recently launched MMORPG (massive multi-player online role playing game) much like “World of Warcraft“. You’d think we’re back to the Tech Bubble era where companies would slap a dot com after their name, have one product or service related to the internet and float shares… and watch them soar into the stratosphere. 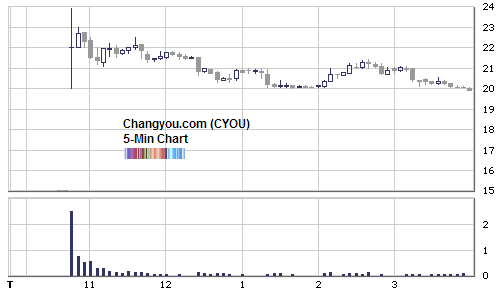 CYOU shares received healthy demand and priced in the upper range ($14 to $16) and popped at the open. Unless you were able to get your hands on an allocation, you missed the +25% one day gain. The difference between this IPO and the Tech Bubble IPOs is that Changyou actually makes money and is a “growth” story. It was priced at around 6.5 times earnings to make it palatable because keep in mind, it is based on only one product - within the very fickle entertainment/gaming sector. Personally, I wouldn’t touch CYOU with a barge pole (as an investment) but after the regulatory IPO period is over, it might be a great short (akin to other one product wonders like Crocs). The last real IPO in the US was Mead Johnson (NYSE:MJN), another spin-off - from Bristol-Myers Squibb (NYSE:BMY). It didn’t open the flood gates of initial public offerings, as many thought, and has traded sideways. The lack of IPOs is not only indicative of a very sick stock market, it is no fun. The only silver lining around this cloud is that, in the long term, the kind of IPO drought that we’re seeing now, characterizes generational lows. Take a look at the long term historical chart of IPOs going back to the 1970’s.